From Artist to Corporate Recognition Experts | Bruce Fox, Inc. Yes, Bruce Fox was a real person. In fact, he was a trained commercial artist whose early career was in advertising in New York as well as a sculptor and self-described “bon vivant”. In 1938 when, upon returning to the United States after an adventure through Central America, he founded the company which still bears his name as the outlet for his artistic energies. While abroad, Fox had learned the trade of metalworking in the native tradition, and was eager to bring his knowledge to the post-Depression American market. Working and experimenting with the most high-tech material of the era—aluminum—Fox began creating works of art, primarily for general décor and use in the home. Through the 1960’s, as the appeal of his art diminished in an era of changing tastes, Fox’s company found itself at a crossroads. A further tribute to the artist’s entrepreneurial spirit, Fox realized corporations and organizations were in need of creative products to serve as symbolic recognition. 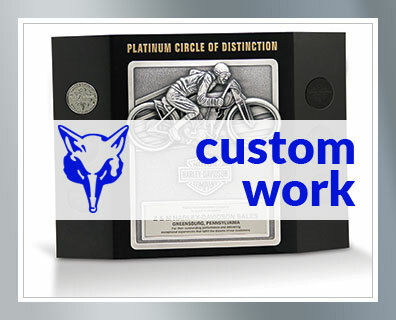 The focus shifted, and Bruce Fox, Inc.—founded on the cornerstones of art and craft—began designing and manufacturing custom designed award plaques and trophies for the corporate world. 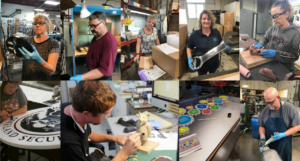 Today Bruce Fox, Inc. is comprised of over 100 skilled craftspeople and professional staff who are devoted exclusively to serving the corporate recognition cause. Like Bruce in his day, we are not making stuff we hope people want, we are creating ideas and crafting products people need. It’s a stark difference between placing a logo on an SKU that’s been on the shelf since it was made several months ago and 6,000 miles away, and creating a unique custom award that is indigenous to the message of the presenter and psyche of the recipient. We are committed to the promotional products market, utilizing independent distributors as the agents for product and program development with end-user clients. These agents are the professionals who serve their clients’ interests first, know the industry sources for the right solutions, and can professionally engage with subject matter expertise. In its early iteration, deliverable promotional products were called advertising specialties. Though the industry has outgrown this terminology, Bruce Fox, Inc. still embodies and embraces the core principles of advertising. If you define advertising as a form of communication used to encourage or persuade an audience to continue or take some new action (as Wikipedia does), well, that’s certainly Bruce Fox the company. And hailing to his early days in the advertising arena, it was Bruce Fox the man also.